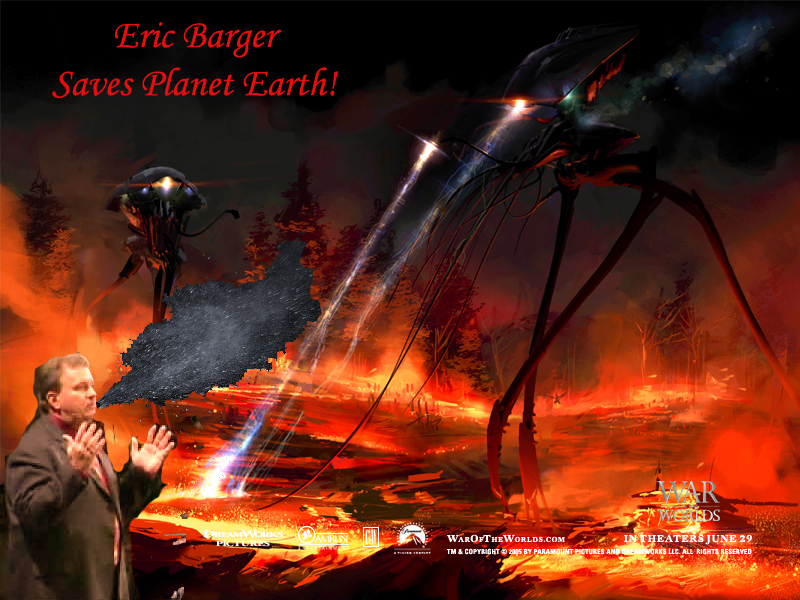 Eric Barger saves planet earth! Actual simulation of the event as Eric Barger described it! In a rare moment of courage, Eric Barger stood up to an actual enemy instead of made up ones! Martians emerged from the sky yesterday and began spreading Martianisms at Eric Barger’s church. In a moment straight out of an H G Wells movie, Eric Barger stopped the evil emerging horde of Martians by… sneezing on them. 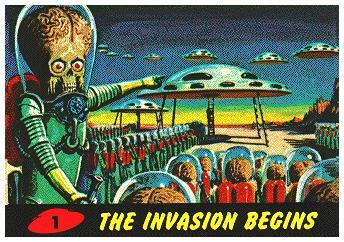 At first the Martians were just disgusted, then after wiping off the mucus, they read a chapter of Eric Barger’s book on UFO encounters, laughed and determined there was no intelligent life on planet earth. We here at the ODMafia are proud to say that shoddy research saved you and if you keep supporting us, we will keep it coming. 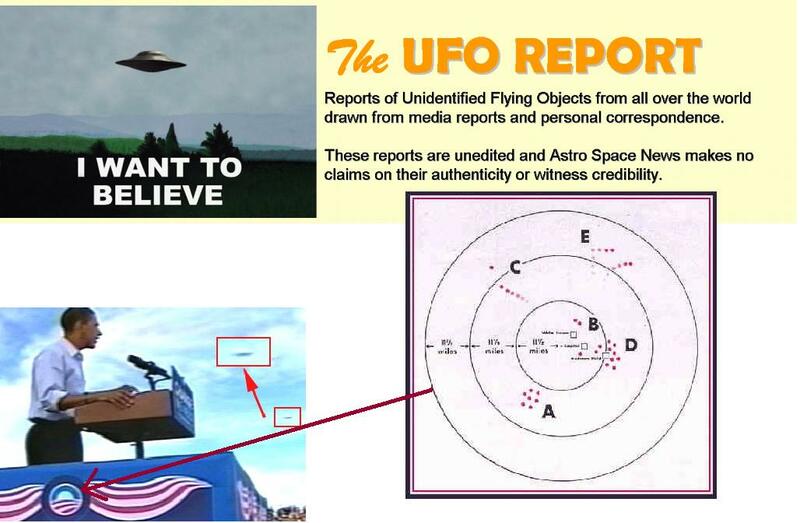 We know that UFOs are going to be used for the excuse of the rapture….since the rapture is really the heart of the gospel. “Believe the rapture and be saved.” The rapture has been a central core doctrine since the beginning and early followers would never relinquish that fact…and waited strategically almost 18 centuries to reveal the truth of end times theology thru TimLahaye books. As for back as we can remember this pure doctrine has been taught and retaught, tweaked, adjusted…but to be sure a true bible believing Christian must focus all their energy and time on tribulation and the rapture. Sensationalism, speculation & conjecture are the kinds of things St. Paul said were marks of the true church. If this topic does not consume you….you are likely a liberal, emergent, moderate or worse…a Roman Catholic. Finally, we must be convinced that all objects we view in the sky and don’t quite understand must be demonic entities ready to seduce mankind. Even though we don’t have enough data to make sense of these things it is best to fear the worst…and rely of fear. Although it would be much easier for demons simply disguise themselves as super-hot-super-models to seduce men …instead demons have been distracted by really cool movies like 2001:A Space Odyssey, Star Wars and Star Trek V. Therefore they have devised a whole sci-fi schemata to trick mankind with all sorts of smoke and mirrors and holograms. Sadly woman won’t fall for these tricky demons because they find sci-fi boring. Therefore, the demons will have to work 3 times harder to seduce them by either disguising themselves as shopping bags or demonic make-up kits. Be warned. The Truth is out there. Be rapture ready. PS if our woman readers are offended by suggesting that they don’t like sci-fi and would rather shop we must make it plain that we believe it is biblical and woman should be busy in the kitchen (sometimes we must offend and tell the truth). Remember, we don’t make the rules, we just enforce them. Subtlety no object for true discernmentalists! 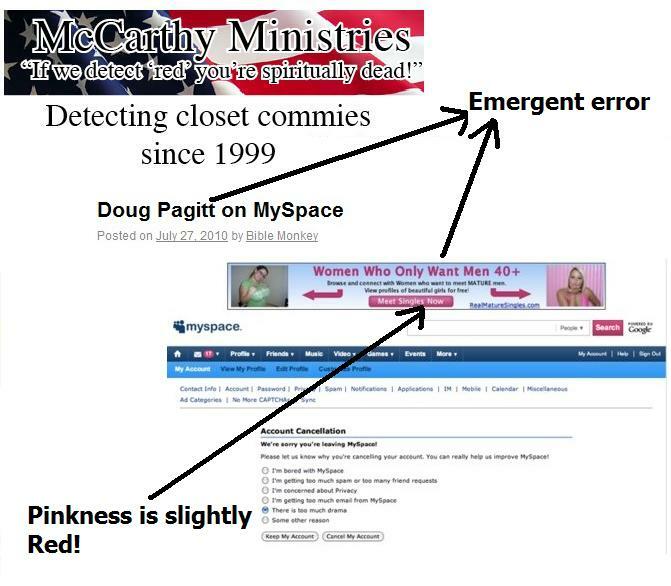 Since our partnership with McCarthy Ministries we have been hell-bent on detection of social gospelers, communists, closet commies, universal health-care enthusiasts and people who share their private possessions. 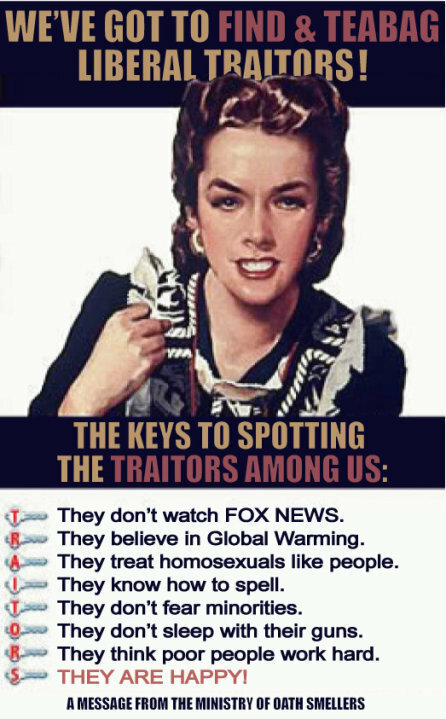 Unfortunately far too often communist sympathizers go undetected or worse commie proselytizers are left to wander the streets and eat our food and drink our water. We are shocked and dismayed to find Take A Stand Ministries secretly promoting and peddling socialism while pretending to be a true bible believing ministry. It just makes me ill. 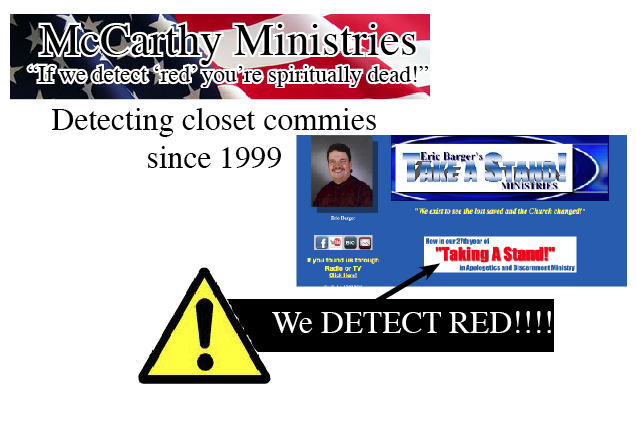 It did not take us long to detect RED in his “Take A Stand” logo. He has secretly embedded his socialist message not in his heading but below it to throw off readers (ie to make them feel less threatened by his red faced secret socialist message, slowly undermining the gospel). Don’t be fooled either. 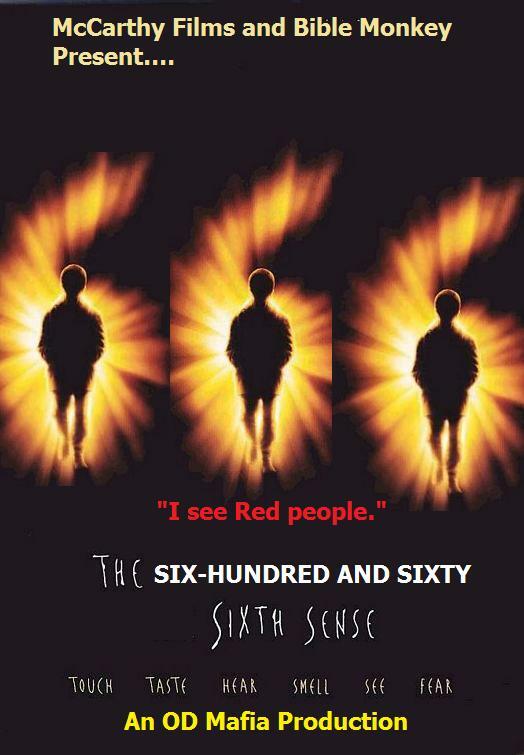 Remember if its red, its wrong! PS We have reason to believe that if Take A Stand is “red” they are likely Red Letter Christians and sympathetic to Emergings! Rich Christiano joins Jan to talk about those pesky little UFOs. 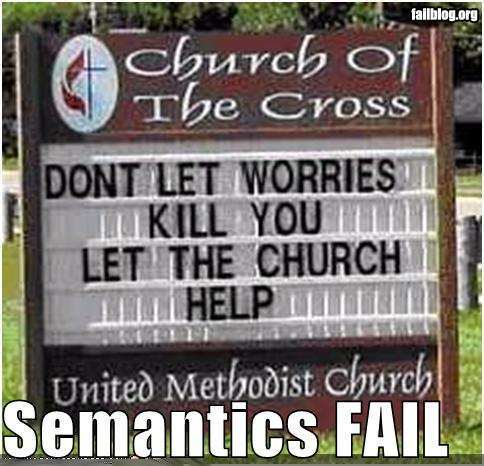 Should Christians take this seriously? Yes! Christiano has produced a film about the subject — a film good for spreading the gospel. He believes, as does this ministry, that these UFOs are demonic manifestations due to the lateness of the hour. After the Rapture, the world will say that these objects took people away and good riddance. OD Mafia Editor’s Note: We have reason to suspect Obama, Lew Rockwell, Rob Bell and all Muslims have something to do with this.